Glucagon plays important roles in normal glucose homeostasis and in metabolic abnormalities, particularly diabetes. Glucagon excess, rather than insulin deficiency, is essential for the development of diabetes for several reasons. Glucagon increases hepatic glucose and ketone production, the catabolic features of insulin deficiency. Hyperglucagonaemia is present in every form of diabetes. Beta cell destruction in glucagon receptor null mice does not cause diabetes unless mice are administered adenovirus encoding the glucagon receptor. In rodent studies the glucagon suppressors leptin and glucagon receptor antibody suppressed all catabolic manifestations of diabetes during insulin deficiency. Insulin prevents hyperglycaemia; however, insulin monotherapy cannot cure diabetes such that non-diabetic glucose homeostasis is achieved. Glucose-responsive beta cells normally regulate alpha cells, and diminished insulin action on alpha cells will favour hypersecretion of glucagon by the alpha cells, thus altering the insulin:glucagon ratio. Treating diabetes by suppression of glucagon, with leptin or antibody against the glucagon receptor, normalised glucose level (without glycaemic volatility) and HbA1c. Glucagon suppression also improved insulin sensitivity and glucose tolerance. If these results can be translated to humans, suppression of glucagon action will represent a step forward in the treatment of diabetes. This review summarises a presentation given at the ‘Novel data on glucagon’ symposium at the 2015 annual meeting of the EASD. It is accompanied by two other reviews on topics from this symposium (by Mona Abraham and Tony Lam, DOI: 10.1007/s00125-016-3950-3, and by Russell Miller and Morris Birnbaum, DOI: 10.1007/s00125-016-3955-y) and an overview by the Session Chair, Isabel Valverde (DOI: 10.1007/s00125-016-3946-z). Glucagon is a pancreatic hormone that is involved in hyperglycaemia, stimulating hepatic glucose production by increasing glycogenolysis and gluconeogenesis. Glucagon increases hepatic glucose and ketone production—catabolic features of insulin deficiency. Recognition of similarities between the effect of glucagon on the liver and the hepatic abnormalities associated with untreated insulin deficiency raised the possibility of a role for glucagon in the pathogenesis of diabetes. This idea gained further impetus from the finding that every form of diabetes in humans and animals is accompanied by absolute or relative hyperglucagonaemia [1, 2], which led to the characterisation of diabetes as a bihormonal disease  in which hepatic overproduction of fuel is caused by glucagon excess rather than directly by insulin deficiency . Studies on glucagon receptor null mice (Gcgr −/− ) suggested that glucagon is essential for the development of the metabolic abnormalities of diabetes. Despite near total beta cell destruction, Gcgr −/− mice showed none of the typical clinical or laboratory manifestations of diabetes . Hyperglycaemia was not detected and glucose tolerance was normal. Hepatic protein levels of phosphorylated cAMP response element-binding protein (p-CREB) and Pepck mRNA were profoundly reduced in Gcgr −/− mice with insulin deficiency, evidence that glucagon action had been effectively blocked. After the insertion of adenovirus glucagon receptor (Gcgr) cDNA, Gcgr mRNA (Ad-Gcgr) was transiently expressed in the liver for several days and then spontaneously disappeared. During the transient expression of Gcgr mRNA in the liver, blood glucose increased dramatically, to over 22.2 mmol/l, and this was accompanied by increased levels of Pepck mRNA and p-CREB. When expression of the Gcgr mRNA diminished spontaneously, blood glucose, Pepck mRNA and p-CREB returned to non-diabetic levels. Following restoration of glucagon function by administration of Ad-Gcgr, diabetes reappeared. These studies suggest that glucagon is essential for hyperglycaemia in type 1 diabetes and that blocking glucagon action prevents deadly metabolic and clinical derangements [5, 6] (Table 1). Without glucagon action, the liver does not produce enough glucose to exceed the native glucose consumption by the brain . Thus, in rodents with a congenital absence of Gcgr, it is possible to destroy all insulin-secreting beta cells without causing abnormal glucose homeostasis and glucose intolerance. Insulin prevents death in diabetic ketoacidosis and dramatically extends life, but does not exert its action in the same way as endogenous insulin. 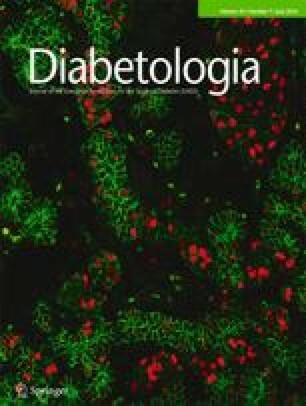 Neither glucose homeostasis nor glycation-related diabetic complications can be fully normalised by insulin treatment . Even patients with optimally controlled type 1 diabetes through multiple injections of insulin may exhibit extraordinary glycaemic volatility, ranging from severe hyperglycaemia with glucose levels approaching 22 mmol/l to interruptions of hypoglycaemia with glucose levels plunging below 2.2 mmol/l. Surprisingly, although insulin replacement therapy has been available for nine decades, the mechanism of this glucose hypervolatility remains to be elucidated. It may be due to differences between secreted insulin and injected insulin. The journey of secreted insulin begins with the release of a high concentration of insulin that controls glucagon secretion and sets the insulin/glucagon (I/G) ratio. The beta cells respond to a meal with the immediate secretion of insulin, such that there is a concentration spike within 5 min, known as the first phase of insulin release. This high undiluted concentration of insulin floods around the alpha cells, leading to suppression of glucagon secretion. The mixture of these two hormones, high insulin and low glucagon (i.e. a high I/G ratio) signals to the liver to take up and store all the incoming nutrients. The majority of insulin receptors are located in the splanchnic tissues. Insulin binds to these receptors, leaving a low level of insulin in the post-hepatic circulation such that peripheral tissues are exposed to relatively low levels of insulin. The fate of injected insulin is quite different from secreted insulin. When insulin is injected subcutaneously, injected insulin forms a pocket between the skin and muscle and is slowly absorbed over a period of 15–60 min. More importantly, a very low concentration of insulin reaches the islets, and normally this is not sufficient to suppress glucagon secretion, resulting in a low I/G ratio. This low I/G ratio signals to the liver to produce more glucose, as in the fasting state. It is this overproduction of glucose that may cause the postprandial hyperglycaemic surges, and necessitates an increased insulin dose. Although this insulin level achieved by injected insulin is far below the paracrine glucagon-suppressing level of intra-islet insulin, it can cause glucose uptake into post-hepatic insulin targets such as skeletal muscles and adipose tissues. This may result in a hypoglycaemic episode. The extreme rollercoaster of glycaemic volatility with insulin monotherapy can be explained by too much post-hepatic insulin action and not enough insulin action on splanchnic target tissues  In fact, if this is the cause of glycaemic hypervolatility, it should be possible to achieve stable euglycaemia by lowering the high concentration of insulin in the post-hepatic circulation and the high concentration of glucagon in the pre-hepatic circulation, and simulate the mode of action of secreted insulin. The studies on the differences between local concentrations achieved with secreted insulin and injected insulin led to the search for a therapeutic suppressor of diabetic hyperglucagonaemia or a blocker of its action on the liver. The first glucagon-suppressing substance to be discovered was somatostatin, after which the potent glucagon suppressor leptin was identified. In rodent models of uncontrolled type 1 diabetes, leptin therapy alone or in combination with a low dose of insulin reverses the severe catabolic state through suppression of hyperglucagonaemia. With leptin therapy, there is far less glucose variability than with insulin monotherapy, and HbA1c is normalised. In addition, in contrast to insulin monotherapy, leptin lowers both lipogenic and cholesterologenic transcription factors and enzymes and reduces plasma and tissue lipids [10, 11]. In a streptozotocin (STZ)-induced mouse model of type 1 diabetes, insulin treatment paradoxically exhibited higher plasma glucagon during hyperglycaemic surges than during normoglycaemic intervals. Blocking glucagon action with a GCGR-antagonising antibody (GCGR-Ab) maintained blood glucose levels below 5.5 mmol/l and HbA1c levels below 6% (42 mmol/mol) in these STZ-treated mice. We have not yet encountered hypoglycaemia (glucose <3.3 mmol/l) in diabetic rodents treated with GCGR-Ab. Even without exogenous insulin administration, GCGR-Ab significantly decreased PEPCK, which is responsible for hepatic glucose production  (Table 2). The pathophysiology of type 2 diabetes is strikingly different from that of type 1 diabetes. In contrast to the lack of beta cells in islets of type 1 diabetic patients, type 2 diabetic patients have a few remaining beta cells . And yet, like type 1 diabetic patients, they have persistent hyperglucagonaemia and are insulin resistant. In Gcgr −/− mice without hyperinsulinaemia, obesity could not be induced by high-fat diet feeding (HFF) . However, the administration of high concentrations of insulin to HFF Gcgr −/− mice resulted in hyperglycaemia and obesity, characteristics commonly observed in animals with type 2 diabetes . The db/db mouse, another model of type 2 diabetes, has a congenital deficiency of leptin with hyperglycaemia and hyperinsulinaemia. However, in db/db mice lacking Gcgr, glucose and insulin levels remain within the normal range. Restoring glucagon function by delivering Ad-Gcgr to the liver of these mice increases glucose and insulin levels . Gcgr mRNA was transiently expressed in the liver and then spontaneously disappeared. Hyperglycaemia occurred upon the delivery of the Gcgr transgene to the liver and persisted until spontaneous disappearance of the Gcgr transgene. When the Gcgr transgene spontaneously disappeared, hyperglycaemia and insulin resistance also disappeared. This signifies that the hyperglycaemia in type 2 diabetes, like that in type 1 diabetes, cannot occur in the absence of glucagon action (Table 1). Because glucose overproduction is maintained by glucagon signalling in the liver of type 2 diabetic animals, the rapid normalisation of hyperglycaemia after acute disappearance of Gcgr mRNA suggests that acute suppression of glucagon action would be a very effective therapeutic method. The therapeutic implications of glucagon suppression by GCGR-Ab were tested in db/db mice. Suppression of glucagon action with GCGR-Ab in ob/ob  and db/db mice normalised blood glucose and HbA1c levels to within the non-diabetic range (Y. Lee, unpublished data). As in the mouse models of type 1 diabetes, suppression of glucagon action with GCGR-Ab treatment normalised the metabolic phenotypes of models of type 2 diabetes (Table 2). Although one cannot assume that results in animals will be reproduced in humans, these results suggest that in patients with type 1 or type 2 diabetes superior control of the metabolic abnormalities might be achieved with suppression of glucagon than with insulin monotherapy. Glucagon suppression with GCGR-Ab is very effective at maintaining stable euglycaemia in type 1 diabetics and type 2 diabetics in rodents [12, 16]. Hypoglycaemia is very rare with glucagon suppression in diabetes. HbA1c levels within the normal range (<6% [<42 mmol/mol]) , can be achieved with glucagon suppression in rodents, levels that cannot be achieved by any other conventional diabetic drugs. If the findings in animals are reproduced in humans, antagonism of glucagon will decrease the insulin requirement, and the frequency of glucose monitoring in diabetic patients will be reduced. Suppressing glucagon action should effectively decrease the long-term complications and metabolic derangements in diabetes, enhancing the quality of life of diabetic individuals. YHL designed and wrote the manuscript. M-YW, X-XY and RHU reviewed and edited the manuscript. Authors declare that there is no duality of interest associated with this manuscript.